Usually ribbons are used to tie things closed. Ever think of tying one to a cookie?! Ribbons are such a great addition when it comes to dessert decorating. They are soooo easy. No fancy skills required. All you need to do is tie a simple bow! They’re available in so many colors so you can match it exactly to your color scheme. I adapted it a little to fit my needs. Follow the instructions well and look out for the hole punching step before the baking so the ribbon can be applied after the cookies are baked. This cookie meets all the criteria for the perfect rolled cookie to decorate; it holds it’s shape, tastes delicious, and is easy to make. Your’e only limited by your imagination when you use the No Fail Sugar Cookie Recipe. This recipe is GREAT when using complex cookie cutters. The dough holds its’ shape and won’t spread during baking. Make sure you let your oven preheat for at least 1/2 hour before baking these or any other cookies. This recipe can make up to 2-dozen 3″ cookies. Cream butter(or margarine) and sugar until light and fluffy. Mix dry ingredients and add a little at a time to butter or margarine mixture. Mix at low speed until flour is completely incorporated and the dough comes together. Roll to desired thickness and cut into desired shapes. Punch two small circles (I used a #12 Wilton icing tip) in the center of each cookie. Punch two small holes in the cookies before its baked. Place cookies carefully on baking sheet and bake at 350 degrees F (176 C) for 8 to 10 minutes or until the cookie begins to brown around the edges. When cookies are baked and cooled thread a 25 cm long ribbon through the two holes so the ends of the ribbon are coming through the front of the cookie. Tie a knot and than a bow. If necessary snip off any excess ribbon. Tie a ribbon through the holes. Want to get a little more creative? Try adding a layer of fondant! For 24 medium sized cookies, You’ll need approx. 500gr of fondant. Roll it to a 2-3mm thickness. Roll fondant to 2-3mm thickness. 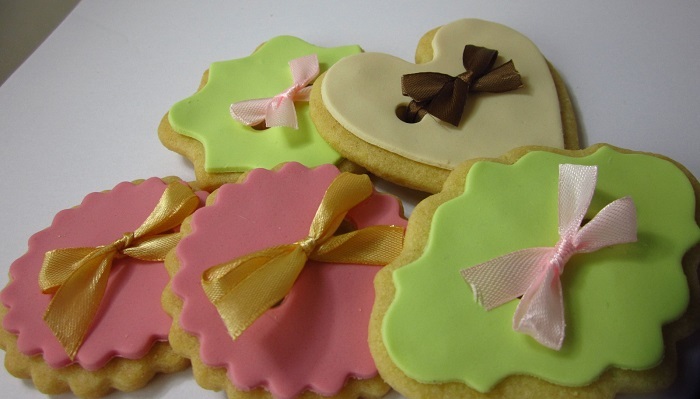 Use the same cookie cutter you used for the cookies to cut out the shapes from the rolled fondant. Brush the cookie with a bit of water and place the fondant piece on the cookie. Use a toothpick to poke a hole through the back of the cookie to mark it than with the circle cutter punch out the same two holes from the fondant. Thread a 30 cm long ribbon through the two holes so the ends of the ribbon are coming through the front of the cookie. Tie a knot and than a bow. If necessary snip off the excess ribbon. Now simply congratulate yourself on a beautiful job! !